Hivemine provides Knowledge Management software products, including AskMe, an award-winning solution that delivers business-ready Knowledge Discovery tools on top of a knowledge management and business process management foundation. AskMe TacitAgent, another Enterprise proven Software tackles business challenges such as expertise identification, employee disconnect and knowledge erosion to help organizations create and leverage knowledge capital – a strategic asset that can speed innovation, reduce costs, and improve customer service. TacitAGENT completes Expertise Discovery by AutoMagically running analytics on users contents to generate Keywords to identify their Area of Expertise. Experienced strategist, leader and founder of multiple technology startups with a track record of success driving growth. Prior companies include InfoMove, Teletronics Management Services, Nexus Cellular and McCaw Cellular. 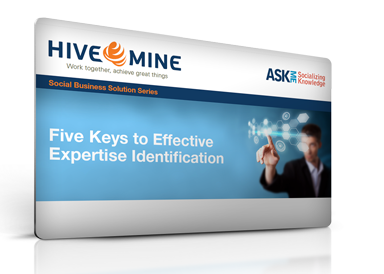 Discover the keys to expertise identification.